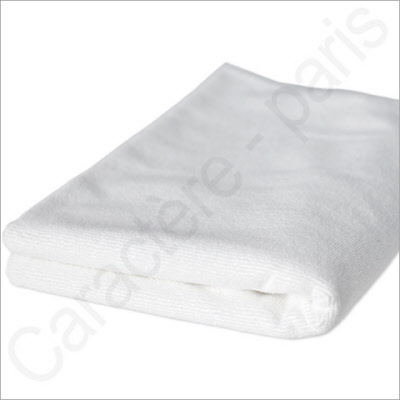 Set of 6 premium quality bath and hotel towels, made from the new generation of super absorbent micro-fibbers, 70 x 140 cm / 28 x 55 in or 100 x 200 cm / 55 x 80 in. The next generation of micro-fibber towels are super absorbent and soft, while at the same time lighter than the conventional cotton towel. Micro fibber towels absorb water and dry faster than cotton towels, with a squishier and softer feel than cotton. The special feature of this microfibre material is its lower weight and lighter mass than conventional towels, which allows better absorption for a lower price than available in cotton towels. This means, comparatively, you'll save room when washing and drying these towels because they take up less space in your machines. Depending on the weight of your older towels, you will save 40% or more space during both the washing and drying of these towels. It's easy to imagine the time and money you'll save, especially over a lifetime of use of these towels. Plus, your clients will be impressed with the extremely high quality and feel of these premium towels. Less washing and drying time also means less cycles of the dryer and washing machine: an environmentally friendly conversion that will also be friendly to your pocketbook. In addition, micro fibber stays soft without the need for added fabric softener: you'll save on your need to purchase both laundry detergent and fabric softener. Size: 70 x 140 cm / 28 x 55 in or 100 x 200 cm / 50 x 80 in.